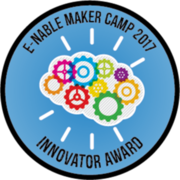 This badge is awarded to those that particpated in the e-NABLE Maker Camp 2017 design challenge to create working hand and arm designs from items you can find in any household, anywhere around the world! These designs must have been made completely out of non 3D printed parts and created from the materials list given to them in the challenge and they must prove their design functions for the task they chose to have it complete! 2. Share your materials list for your design to show what you used to create it. 3. Show photo or video evidence of your design completing one of the listed tasks from the challenge page. 5 If you are interested in entering the drawing for a functional wooden puppet hand, created and designed by Ivan Owen, co-creator of the first 3D printed hand for a child, please fill out the entry form HERE!